Do you know the Hood Street steps? 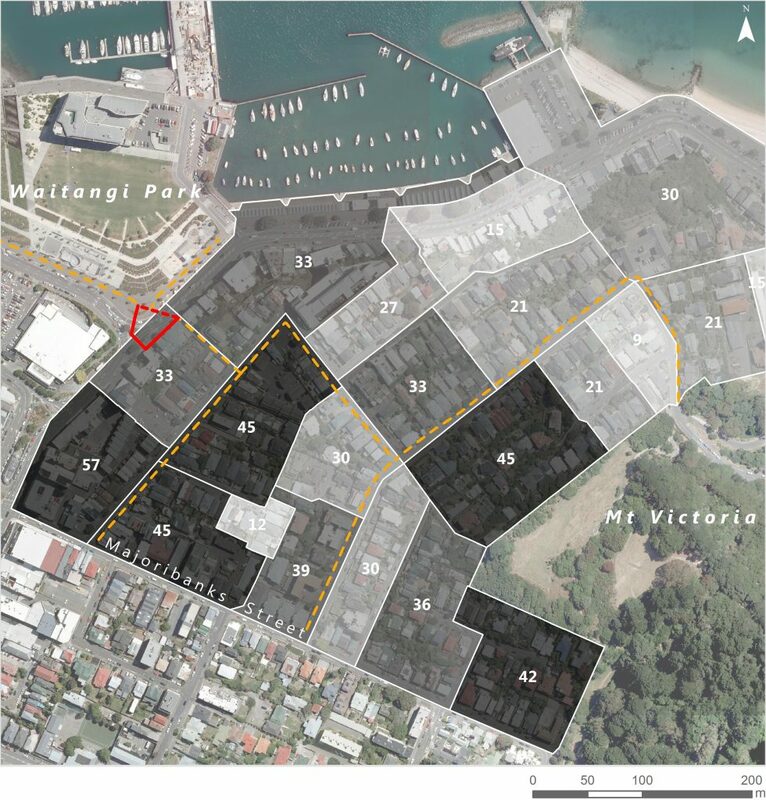 If you live near Oriental Bay or Mt Victoria you will – they are an important connection between Mt Victoria and Oriental Parade / Cable Street. They’re the only route through the long built-up block between Roxburgh St and Oriental Parade. Many of the many Mt Victoria residents (see picture below) use the steps on their walk to and from work, via Cable St or the waterfront. Many more people use the steps to go between the waterfront and the town belt. To get between the sea and the Hood Street steps via the official route you have to cross three bits of road – see the picture below. The official route is much longer than the direct route which has no provision for pedestrians. 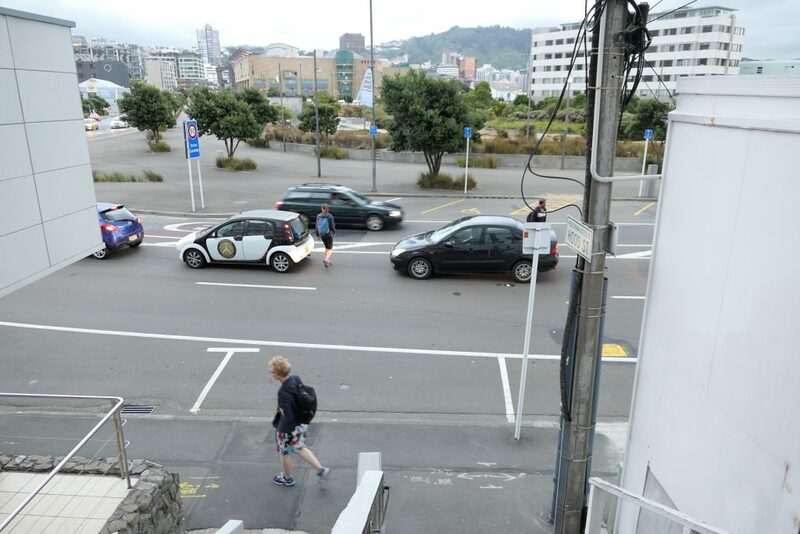 Wellington City Council recently “improved” the official crossing route – replacing a zebra with lights – which has made it even worse for people. The word is that it was one of the “quick wins” identified somehow for Let’s Get Wellington Moving, but it’s a bit mysterious. Whatever the motivation, the result is: the official route can now take up to ten times as long to cross than the direct route, based on timing several light phases one weekday morning. Most people still just take the direct route anyway, taking their chances amongst the cars. That’s okay for those able to make the dash but everyone else must take the longer and slower route. That’s you if you have kids, or groceries, or walk slowly, or use a wheelchair or scooter, or just don’t feel like staring down an oncoming car. So to sum up, the existing crossing tells everyone on foot or mobility wheels to go out of their way and wait longer, on an important walking route for the city. (Or dash across, but make sure you are fit and confident because there’s no zebra crossing to give you some rights versus cars). Aren’t we supposed to be making Wellington more people-friendly, not less? There must be some important reason to prioritise cars over people like this, ignoring the basic human desire to take the most direct route – and WCC’s own road user hierarchy (p46 here) that prioritises people first. 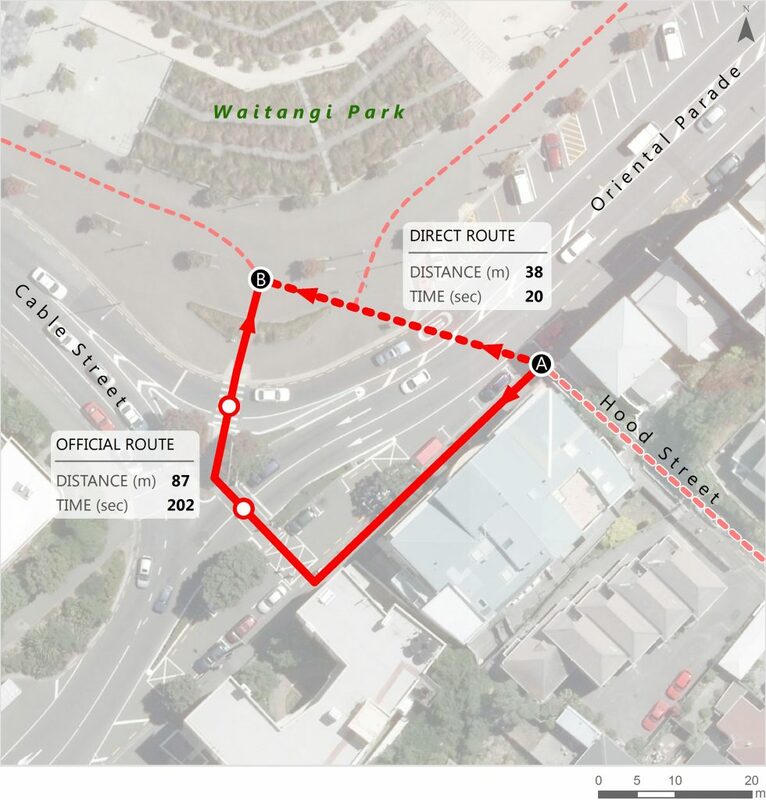 Why not make a small but important statement that Wellington is for people: formalise the direct route with a zebra straight across Oriental Parade from the steps. 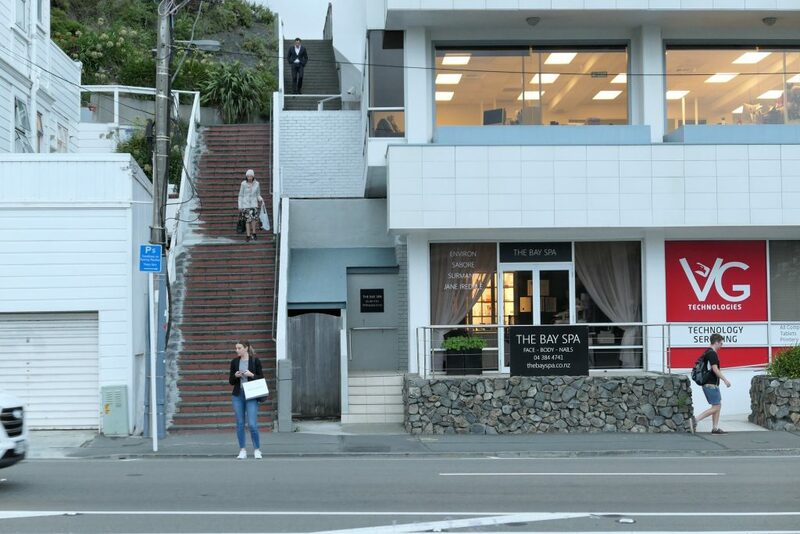 Do you know or use the Hood St steps, or cross Oriental Parade here? Why do you think the council changed the intersection? Do you find it better or worse than the old arrangement? This is a very fair point. There are many places where pedestrian desire lines don’t coincide well with road intersections, and traditionally the need for efficient traffic management has been prioritised over pedestrians. This is especially so on arterial roads. It should not be impossible to provide a crossing at Hood Street and I will ask the council’s traffic engineers to look into this. I’d also like to see a safe crossing on the south east corner of New World supermarket, where Oriental Bay sweeps around into Wakefield Street. Thanks for your attention to this, Chris. A review of the current arrangement would be welcome given the heavy use the steps get and their strategic location in the city. The car park spot plumb at the bottom of the steps, which is generally occupied, is a further impediment to those crossing directly. While there are plenty of anecdotal mutterings about the present situation, do you know if the Mt Vic Residents’ Association has a view on the matter? Totally agree on the New World crossing you mention which also requires a quick dash, making it unsuitable for a good chunk of the population. Yes it was one of the “quick wins” from Let’s Get Wellington Moving. 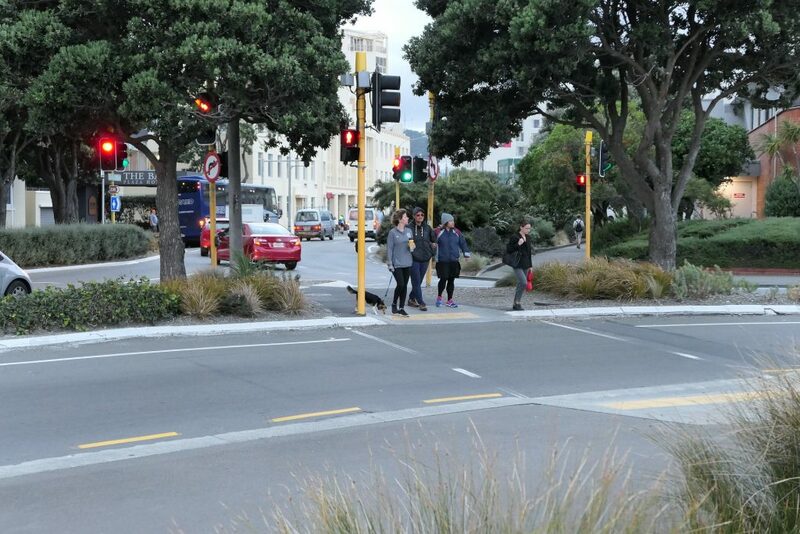 “Signalising the pedestrian crossing on the left turn lane at the intersection of Cable Street and Oriental parade to improve traffic flows”. It was never about a walkable city, it was so cars could flow better.